To support the campaign, a short social film that pays tribute to the best, classic pizza commercials was created. Guests who want to flaunt their love of pancakes and pizza can also purchase a limited edition Pancizza t-shirt from the PancakeWear Collection at the IHOP Pancizzeria in NYC on Saturday or online at shoppancakewear.com starting today. 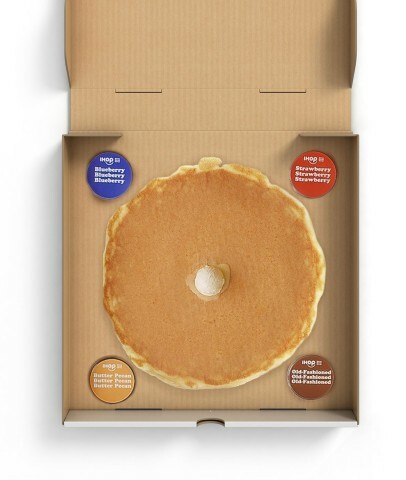 The Pancizza activation, created in collaboration with the brand’s creative agency, Droga5, also marks another milestone for IHOP as it recently surpassed 1,000 IHOP restaurants available for online ordering and delivery through DoorDash. IHOP announced its national delivery partnership with DoorDash in mid-2018, a first for the brand and part of its 60th anniversary celebration. The number of participating IHOP restaurants available on DoorDash has tripled in just 6 months. Quantities at both the Pancizzeria Shop and through DoorDash Delivery are limited and only available while supplies last. Learn more at IHOP.com. *The IHOP Pancizzeria Shop is located at 69 7th Ave South, New York, New York. Guests can receive one free slice of Pancizza, dine-in only on Saturday, February 9, 2019 from 11am-11pm EST. Quantities are limited and available while supplies last. Toppings may vary. **$0 delivery fee with code PANCIZZA. First-time users only. Offer valid 2/8/2019-2/10/19. Limit one per person. Valid only in Dallas, Texas, New York, New York, Chicago, Illinois, Los Angeles, California. Other fees (including service fee), taxes, and gratuity still apply. All deliveries subject to availability. Must have or create a valid DoorDash account with a valid form of accepted payment on file. No cash value. Non-transferable. Use promo code PANCIZZA to redeem. See full terms and conditions at dasherhelp.doordash.com/offer-terms-conditions. ***$0 Delivery fee onorders of $10 or more placed through DoorDash between February 8-14, 2019. Use promo code IHOPDELIVERY to redeem. Other fees (including service fee), taxes, and gratuity still apply. See full terms and conditions at dasherhelp.doordash.com/offer-terms-conditions. Offer, price and participation on all promotions may by location. Delivery is not available at all IHOP restaurants. For 60 years, IHOP has been a leader, innovator and expert in all things breakfast, any time of day. The chain offers 65 different signature, fresh, made-to-order breakfast options, a wide selection of popular lunch and dinner items as well as meals under 600 calories. IHOP restaurants offer guests an affordable, everyday dining experience with warm and friendly service. As of September 30, 2018, there are 1,805 IHOP restaurants around the world, including restaurants in all 50 states and the District of Columbia, Puerto Rico and Guam as well as Canada, Mexico, Guatemala, Panama, Lebanon, the Kingdom of Saudi Arabia, Kuwait, the United Arab Emirates, Bahrain, Qatar, Thailand and India. IHOP restaurants are franchised by affiliates of Glendale, Calif.-based Dine Brands Global, Inc. (NYSE: DIN). Bleecker Street Pizza is a New York pizza mainstay that has been serving authentic, homemade New York style slices from the West Village of Manhattan for 14 years. Recently, the Tuscan-style pizza shop expanded from its walk-up counter to include additional seating for 35-40 dine-in.